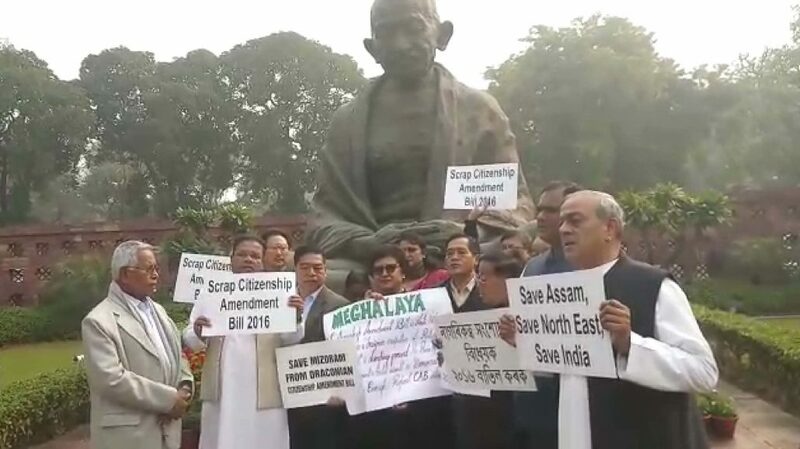 Continuing their protest against the Citizenship (Amendment) Bill, MPs from Northeastern states on Wednesday staged a protest demonstration inside Parliament premises. Meanwhile, Assam Pradesh Congress Committee president (APCC) Ripun Bora reiterated his demand to resume CBI investigation against Assam finance minister Himanta Biswa Sharma for his involvement in the multi-crore Saradha scam. “We have staged the protest demonstration inside the Parliament premises. Though the Bill has not been included in the business list of the Rajya Sabha, we want to make it double sure that the government could not bring the Bill in the House,” APCC president Ripun Bora said. He said that all opposition MPs from Northeast raised the issue in the Rajya Sabha. Referring to the Sardha scam and the recent developments that took place in Kolkata between Kolkata police and Central Bureau of Investigation (CBI), Bora said that law should be equal for all. “CBI had earlier initiated investigation against Himanta Biswa Sharma but the moment he joined BJP the investigation was stopped. The government is openly using country’s nodal investigative agency to gain political mileage,” accused Bora. The APCC president also criticized the home ministry after the Supreme Court reprimanded the centre for its alleged plan to dilute the NRC update process.